THE MANITOU CLIFF DWELLINGS ARE COMPRISED OF ANASAZI RUINS THAT DATE BACK 800 TO 1000 YEARS OLD. The 40 room site was originally located in McElmo Canyon, which is in the southwest corner of Colorado near Mesa Verde and Dolores. 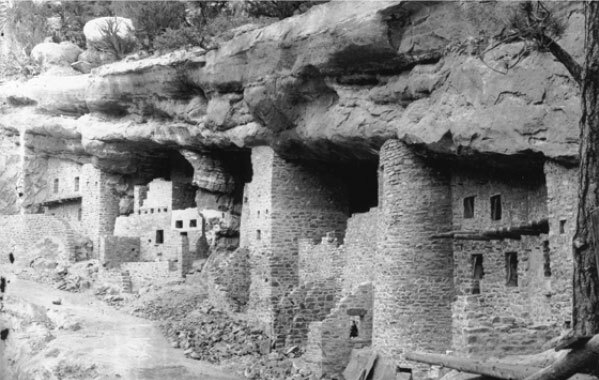 The process of relocating these cliff dwellings began in 1904 and was completed in 1907 when the preserve was opened to the public. Virginia McClurg, the original founder of the Colorado Cliff Dwellers Association, hired William Crosby and the Manitou Cliff Dwellings Ruins Company to begin this process. They wanted to preserve and protect these dwellings from looters and relic pot-hunters. Their company spent many months mapping out the dwellings in McElmo Canyon. Prior to the 1906 Antiquities Act, the Federal Government did not get involved in protecting these historic sites. Virginia McClurg wanted to change this. She and Crosby’s company therefore began a preservation project and acquired the rights to move a portion of the dwellings from McElmo Canyon to Phantom Canyon, later to be renamed Cliff Canyon, here in Manitou Springs. Over a several year period, the ruins from McElmo Canyon were collected, packaged, and finally moved by oxen out of McElmo Canyon to Dolores, Colorado. There, they were loaded and shipped by railroad to Colorado Springs, and finally brought to Cliff Canyon by horse and wagon. Crosby’s men then faithfully reassembled the dwellings in dimension and appearance to those in the four corners region, instead they used a concrete mortar in 1907 as opposed to the adobe mud/clay mortar the Anasazi used. This allows individuals to walk inside and tour through our dwellings. The Manitou Cliff Dwellings is a preserve of these ancient dwellings, here to protect them for future generations to visit. The creation of the Manitou Cliff Dwellings Museum and Preserve was the vision of Virginia McClurg and Harold Ashenhurst. It was undertaken to create a museum that preserves and protects the fine stonework architecture of the Southwestern Indians, which at that time, were unprotected from vandals and artifact hunters. The impact of these careless people threatened to wipe out the great architectural achievements of the Anasazi Indians. In 1907, our preserve was acknowledged by Dr. E. L. Hewett, Director of American Archaeology and father of the Antiquities Act, for its detail of workmanship and educational purpose. Our three story pueblo structure demonstrates the architecture of the Taos Pueblo Indians of New Mexico. These Pueblo Indians are descendants of the Cliff Dwelling Indians belonging to the Anasazi cultural line. This pueblo building was erected at the turn of the century and home to a Native American family of dancers who entertained the tourists for several generations. This Native American family lived in the pueblo as late as 1984. Over the years, the pueblo was expanded into museums of pottery and artifacts. It has since been expanded to include our souvenir shop that offers Native Made pottery, jewelry, and artifacts, as well as Colorado and US made gifts. We welcome you to explore the Anasazi culture and get a “hands on” educational experience, while you are visiting the Pikes Peak region.